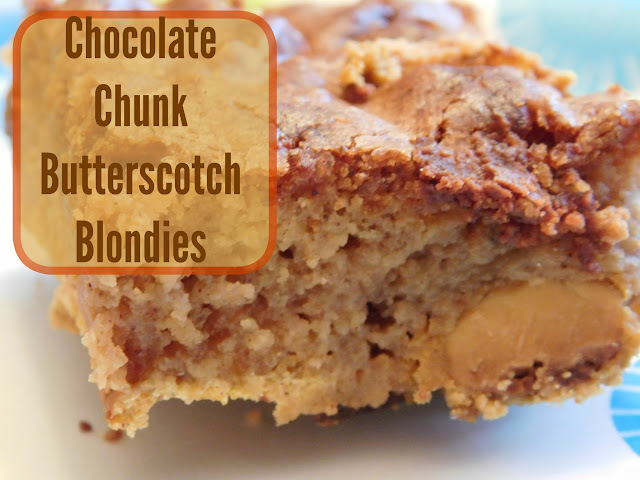 I ended up making some delicious Chocolate Chunk Butterscotch Blondies last week. I had gotten my inspiration from Living on Cloud Nine's Cinnamon Toffee Blondies. Those blondies looked soo good but I have yet to find cinnamon chips anywhere! I did however find a bag of M&M White BOO-ttersctoch candies in the Halloween isle at Target and picked up a bag. I love butterscotch and I like M&M's so I wanted to try them. I figured I'd bake something with them but I just wasn't sure what. I finally settled on some blondies and decided to use the recipe for the Cinnamon Toffee Blondies to guide me. With a few minor tweaks here and there I came up with a yummy, flavorful, chewy blondie that my family just found irresistible! 3 1.55 oz Hershey bars broken into bite sized pieces. I began by beating the eggs and the vanilla together in my stand mixer. Next I put the two sticks of butter and the brown sugar in a small saucepan to heat on the stove. Once melted I set it aside to cool. In a separate bowl I mixed together the flour, salt, baking powder, and cinnamon. I used more cinnamon than the original recipe since I wasn't going to be using any cinnamon chips and I just LOVE the flavor of cinnamon. I also thought the cinnamon and butterscotch would be a perfect pairing of fall flavors- yum! I added the flour mixture to the saucepan of butter and sugar then added everything to the egg mixture. With the stand mixer on medium I combined everything until I had a uniform texture and color. I added in the M&M candies (reserving a handful to sprinkle on the top of the blondies) and the Hershey bars. Then poured the mixture into a greased 13x9 pan. I sprinkled the remaining M&M's on top. I baked the brownies at 350 for 45 minutes; or until a toothpick inserted 2 inches from the edge came out clean. I was disappointed that my M&M decorations had sunk through the brownies and found that most of the "toppings" had landed on the bottom of the blondies! Luckily they still tasted delicious! Once cooled fully we cut them into bars and stored in an airtight container on the counter. Look at those huge chunks of crunchy butterscotch! Oh girl, absolutely brilliant! Those M & M butterscotch candies or "boo" scotch, so cute were a perfect addition and I just absolutely love what you did with the recipe! I think I may be giving use a whirl as well! 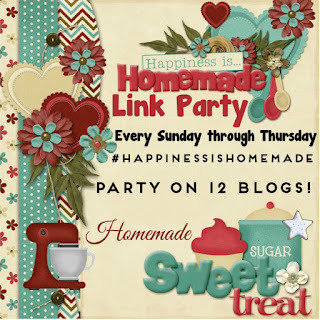 I'm so happy we can share in the creativity sweet lady, just love that about blogging! Have a wonderful Sunday with your family! I am loving this recipe! It has all the ingredients I love. I usually only see cinnamon chips around Christmas. I'll have to look for them then and stock up! My boys have been begging me to make another batch of these. I need to get to the store and buy some more butterscotch M&M's. They were quite tasty! Aw, thank you. I hope you can some up with something similar! This looks so yummy!! Thanks for sharing at #merrymonday We hope you will join us again.